ROSETTA Pyramid™ enables a life science company to collect, categorize, index, track and archive the company’s interactions with regulatory authorities. Whether it’s a submission to a regulatory authority, correspondence from an authority, fax, email, phone conversation, or face-to-face meeting, the interaction record/event can be tracked in the system and the associated documents can be stored in an integrated electronic document management system (such as EMC Documentum) for instant retrieval. There is no efficient way to see the chronology of interactions, incoming or outgoing, related to a product, drug application, specific topic, timeframe, etc. Inability to quickly find submission documents electronically as regulatory personnel are trying to communicate with the health authorities – thus resulting in wasted time and delays in resolving regulatory questions. There is no convenient and reliable way to retrieve the complete set of information and documents as they are stored in several disconnected systems, repositories or tools. Inability to effectively answer questions about where and when submission or study documents have been sent because the links from authored submission documents to the detailed contents of a compiled/assembled submission are not readily searchable. As submission documents are being written, assembled, published and ultimately sent to regulatory authorities, the same metadata is being entered multiple times in the process. Submissions prepared in the Electronic Common Technical Document (eCTD) format are stored in a different system separated from submissions prepared in legacy formats because the new eCTD viewing system can not store legacy submissions or vice versa. Regulatory personnel is relying on creating their own spreadsheets for the interactions related to their products. 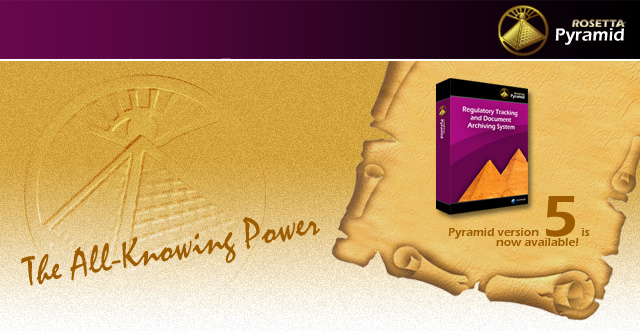 As part of the appropriate regional module, ROSETTA Pyramid comes with an integrated, web-based, full lifecycle eCTD viewer, the ROSETTA Phoenix, to provide you the true all-knowing power in one single system. Improved compliance and records management practice by enabling your organization to centrally manage regulated records and documents electronically at the earliest touch point possible. Supports outgoing eCTD, NeES, paper, hybrid submissions and incoming correspondence, as well as informal records of contact such as faxes, email and face-to-face meetings. New Administrative User Interface: It provides administrators to configure system parameters (such as Record Types and Extended Metadata) with ease and the changes can take effect immediately without a server reboot. New optional Rest of World (RoW) module: In addition to the U.S., E.U. Canadian and Japanese modules, the new RoW module (licensed separately), extends the system's functionality beyond the countries or regions that already accept submissions in eCTD format. It allows the tracking and archiving of regulatory submissions and correspondence between a life science company and health authorities worldwide. Configurable Application Types: As part of the RoW module, the limitation of hardcoded Application Types (e.g. IND, NDA, MAA, NDS) is now eliminated. Now you can define new Application Types through administrative user interface at any time without having to wait until the next software release. Five versatile electronic forms - each is designed to collect a different set of record attributes, and are provided and serve as templates for indexing records. New licensing options: Now you have the option to license each regional module or the RoW module one by one as you roll out from one region to another - and potentially worldwide - at your organization's pace, and you only pay the necessary license fees as you go.